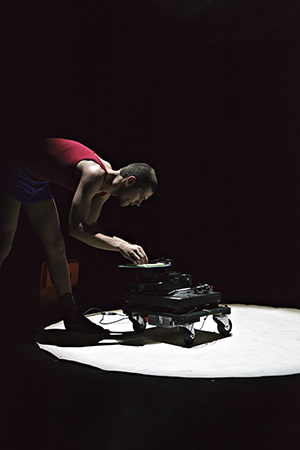 MULTIVERSE is one of multiple productions by emerging artists that will be shown at the final day of SPIELART Festival. They can be visited one after another on Nov 11. For more information click here. In the beginning there was nothing – and that exploded. On the stage: turntables, records, frisbees, rhythm machines, kitchen devices, and everyday junk. 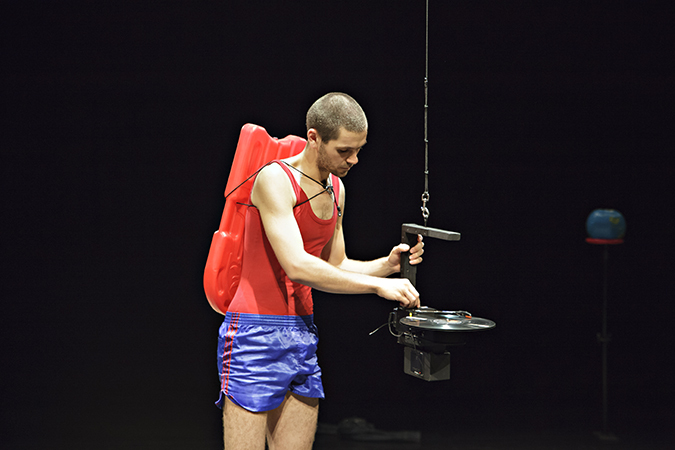 Louis Vanhaverbeke becomes a multifunctional DJ, who lets everyday objects mutate into sound machines. He scratches and brushes virtuously and playfully his favorite hits with the record needle against the grooves for so long until enough room is created for thoughts. 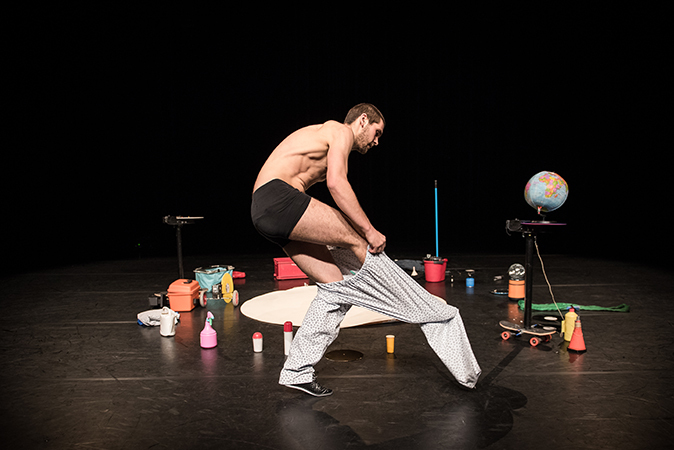 In addition, he tosses rap, spoken word, and a few wellplaced stunts into his small multiverse, and he juggles with objects, voices, and sounds. MULTIVERSE is a dynamic declaration of love to fantasy and the reappraisal of things that appear to have no value in a throw-away society. 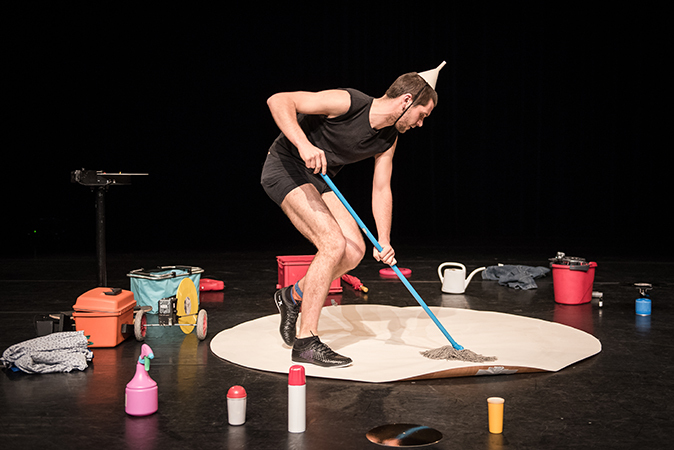 The award-winning young installation and performance artist Louis Vanhaverbeke produced MULTIVERSE at CAMPO in Ghent; he has also been an »associate artist« at the Beursschouwburg, the cultural center in Brussels, since 2017. Louis Vanhaverbeke (b. 1988 in Ghent) creates performances and installations. In 2010 he graduated from Atelier Mixed Media at Sint-Lucas Ghent (now called LUCA School of Arts), and in 2014 he graduated from the School for New Dance Development (SNDO) in Amsterdam. His artistic interest focuses on the clash of different life styles and subcultures. 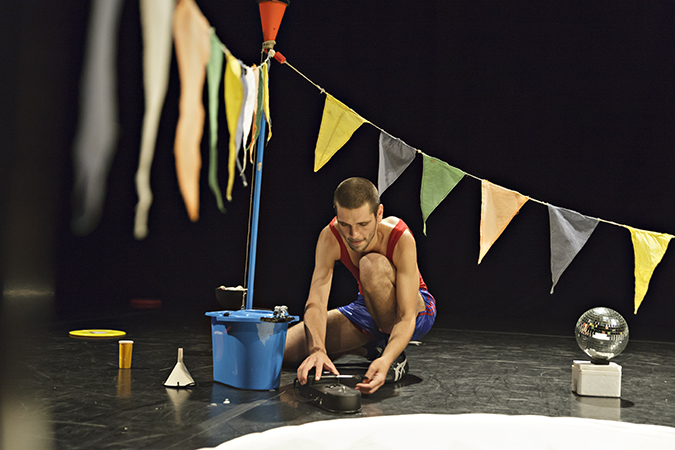 Music as an expression of identity and objects – plastic parts, drum machines, small carts, and all sorts of colorful equipment – play a large role here. 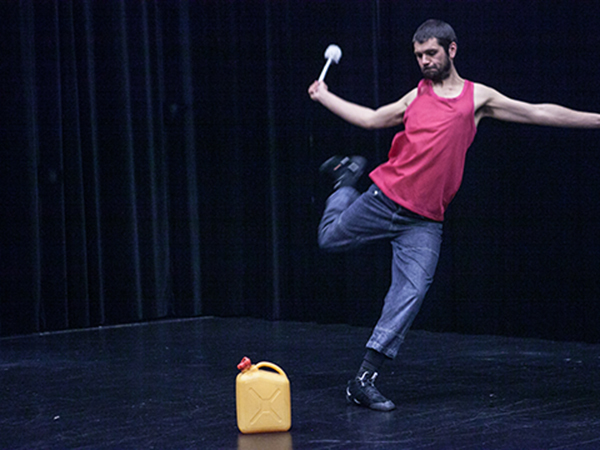 In interaction with these objects as well as through verbal and vocal techniques such as slamming, rhyming, and rapping, Vanhaverbeke attempts to localize and delocalize himself on the stage and in the world. Production CAMPO arts centre, Ghent Support from OVS, Kunstenwerkplaats Pianofabriek and Vooruit.